The European Tour in May and June 2012 was twelve shows long and took Linkin Park back to some of the largest European festivals during their promotional run for Living Things. Before this tour kicked off, the band performed a series of shows across Los Angeles, plus the Billboard Music Awards in Las Vegas. On May 16th, Linkin Park invited 100 KROQ winners to Third Encore for a six song rehearsal, where they debuted Burn It Down for the first time. A highlight at this show was the debut of the new "Apaches" intro to Waiting For The End, which featured Mike rapping the second verse from Until It Breaks over a Waiting For The End beat. This intro would go on to remain in the band's setlists for the next two and a half years. The song had an outro rehearsed but at this show it was not played (hence 'No ext. outro' on the setlist). The outro made its debut at the following show in West Hollywood. A performance at Third Encore on May 17th, the next day, was broadcasted to the Rio+Social event in Rio de Janeiro, Brazil on June 19, 2012. The stage design at Third Encore was set up for the next day's LP Underground / Music For Relief (Power The World) show in West Hollywood. After these warmup performances, the first real show of the year was a special one - an intimate show for LP Underground members only (the first since 2003). Tickets were $99 and sold out within minutes. Proceeds from each ticket were given to "Power The World" by Music For Relief and Linkin Park. A brand new, headlining setlist of 21 songs was debuted at the show. With You was performed for the first time since August 2006, Runaway was performed for the first time since May 2007, Somewhere I Belong and Points Of Authority were performed for the first time since August 2009, and Waiting For The End featured its new outro. On May 20th, the band performed Burn It Down at the Billboard Music Awards in Las Vegas, Nevada. The tour kicked off at Rock in Rio Lisboa V in Lisboa, Portugal. Another new setlist was debuted, with A Place For My Head opening. The song featured a new, extended intro and an extended outro. It was also the first time it has opened a show since June 8, 2001 in Tinley Park, IL. At this show, Lies Greed Misery was debuted live. Fred Durst from Limp Bizkit (who played earlier in the day) gave a shout out to Linkin Park during the LB set and sang part of In The End. As usual, this show was webcasted online and shown on television. Shows followed at Pinkpop (the first Linkin Park performance at the festival) and Skive, before the Rock am Ring and Rock im Park festivals. Unfortunately 2012 was the only time that the Linkin Park set at Rock am Ring was not webcasted live or shown on TV. Instead, a select portion of the Rock im Park show was shown on German TV in April 2013. Between these two shows, the band played Burn It Down at TV total Autoball EM in Köln. This was the first known time that Chester ever lipsynced a song live. The playback audio from the Rio+Social event in May was used. On June 5th, Linkin Park headlined at intimate show at Admiralspalast in Berlin, Germany. The show was filmed for the Living Things concert event in USA theaters June 25, 2012. Later, the theatrical release was released on the Living Things+ DVD. Tickets for this show were given out for free in limited numbers to LPU members. 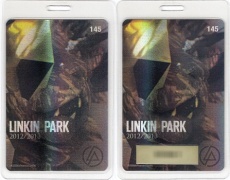 Non-LPU members could win tickets from a Telekom Street Gigs contest to gain admission. At the show, the band played the headlining setlist they debuted at West Hollywood's intimate show and then began rotating between the "headlining" and the "festival" setlists the rest of the tour. Before this show, Linkin Park "performed" Powerless at soundcheck to be included in a video of the song to promote Abraham Lincoln: Vampire Hunter (including footage from the song, the film, and other portions of the Berlin show). It was directed by Timur Bekmambetov. Very few shots of Brad are shown due to Mike recording the guitars on the song in the studio. It is unknown if they played along with a backing track, halfway performed it, or played the full song. This is the only time that the song has been played live in any form by the band. The first Linkin Park show in Romania, held in Bucharest, was on June 6th. At NovaRock in Austria, the band was forced to play a shortened setlist due to their show time being pushed back because of weather. There was a storm headed towards the venue with 40mph+ wind gusts so the promoter made the decision in the afternoon to move fans away from the stage area for 45 minutes. This delayed Rise Against's set, forcing them to cut songs, and forced Linkin Park to play an abbreviated sixteen song setlist. Songs dropped include With You, Runaway, Somewhere I Belong, Breaking The Habit, 'OATR/SOTD/Iridescent (Ballad Medley), and Crawling. This was the first time Crawling has ever been dropped from two shows in a row. It was dropped from the Bucharest show, likely to give Chester a break from the song (as evidenced in LPTV episodes from the era). The first Linkin Park show in Ukraine was held on June 12th in Odesa. This show was in between two Russian shows in Moscow and St. Petersburg. In Bucharest, Romania, Mike had keyboard problems at the beginning of New Divide so it was stopped and aborted. Over the next few minutes, Brad walked around to the rest of the band and got the band to play an impromptu A Place For My Head. The bridge was extended with Chester's "you try to take the best of me, go away" part being doubled. After the song, New Divide was then played in full. At the Warsaw, Poland show, the band mistakenly skipped New Divide, which was on the setlist after Crawling. There is an LPUTV episode about this incident. After this tour, the band went to Japan a week and a half later to promote the album, performing at two Japanese TV shows in a row (Music Station and MTV VMA's Japan). Brad did not travel to Japan for the two promo shows because he was sick. These were the first two shows Brad has ever missed. Instead, Mike's guitar tech at the time named Jeremy filled in. At Music Station, Burn It Down was performed, and at the MTV VMA's, Lies Greed Misery, Numb, and Burn It Down were performed. Due to the songs airing on television, the band performed abbreviated/shortened versions of Lies Greed Misery and Numb, the first and only time either song had been played in that form. Finally to finish out the promotional cycle for Living Things, Linkin Park played Jimmy Kimmel Live on June 27th, their first performance on the show since 2007 but the first time on the Kimmel stage since 2003 (the 2007 performance was at the House of Blues). Fans were treated to performances of Burn It Down, Lies Greed Misery, Faint, New Divide, Numb, and What I've Done. A full headlining show for X-Games MUSIC took place at LA's Club Nokia on June 29th and was webcasted online. This page was last edited on 18 October 2016, at 20:30.